Saragolla is an old variety of durum wheat, which is widely used in Italy, above all during the Kingdom of the two Sicilies. It was so widespread that the word “Saragolla” used to indicate the durum wheat in general. 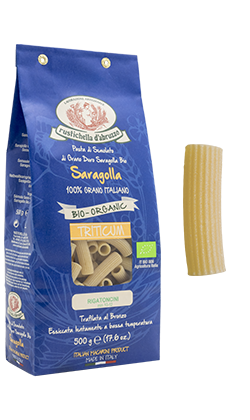 A number of historical testimonies claim that Saragolla is a refined durum wheat that has a high performance and extraordinary quality of semolina, excellent for making pasta (for its high protein content). The use of this wheat in Abruzzo is documented in the Treaty of 1830 “Economia rustica per il Regno di Napoli” by Luigi Granata. Saragolla developed such a particular rusticity and height that it can be perfectly used in the organic agriculture. Furthermore, Saragolla has a well balanced amount of carbohydrates, fibres, proteins, essential fatty acids, vitamins and minerals such as selenium, magnesium and zinc. The pasta made with only 100% Italian organic ‘Saragolla’ durum wheat semolina is characterised by its particular colour (amber- yellow), its resistance ad its intense, spicy but even delicate taste, which allows us all to try all those old tastes of the past that could have been disappeared. 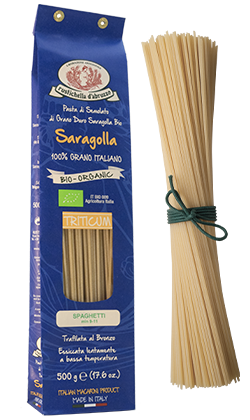 Rustichella d’Abruzzo 100% organic Saragolla Spaghetti have the unique rusticity, intense perfume of the wheat and versatility. Try it with Rustichella d’Abruzzo “allo Scoglio” or “Vongole alla Marinara” sauces. For an even more organic version, we recommend to try it with Rustichella d’Abruzzo organic “Pesto alla Genovese”, one of the “great classic recipes” of the cuisine of Liguria, made with fresh and perfumed basil, Extra Virgin Olive Oil, nuts, pine nuts and grated cheese. Cooking time: 9-11 minutes. Rustichella d’Abruzzo 100% organic Saragolla Rigatoncini is characterised by the typical lining on the surface and a smaller diameter than the one of classic Rigatoni. This kind of pasta is always present in a lot of recipes and is perfect to collect the sauce thanks to its particularly rough and porous texture. We recommend it with Rustichella d’Abruzzo organic “Arrabbiata” or organic “Pomodoro e Basilico” sauces, which are made through slow boiling of 100% Italian tomatoes and Extra Virgin Olive Oil from the Aprutino-Pescarese area. Cooking time: 10-12 minutes.